This is my favorite still life I ever painted. I love anything Italian, maybe since I was born there, not sure why. So the colors of red white and green, always work for me! I wanted to paint this vase. This is my favorite vase, and I can not tell you how many times people have asked to buy it from me. NO! It is mine! ha ha! This painting all started with the vase, then I found an olive branch, then an original first edition copy of the classic book, "The Godfather" - has to toss that in. I then grabbed a red rose for the romantic theme of the movie. My friend came into my studio and said "I know just the thing you need to add to this!" she came running back with this horse head cast. I loved it!! 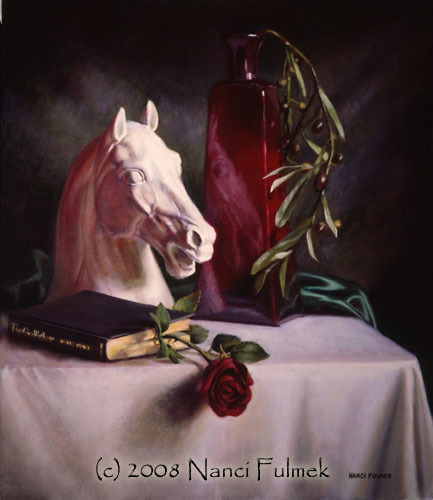 The part that totally makes this painting, is the eerie reflection of the horse head in the vase.